There is a new, direct train connection between the cities of Mataro and Figueres, with stops at Blanes, Girona, and smaller places along the way. This Girona-Blanes train information is up-to-date as of August, 2014. The new train line, RG1, eliminates the need to transfer at the station of Maçanet/Massanes — which often included long waits. 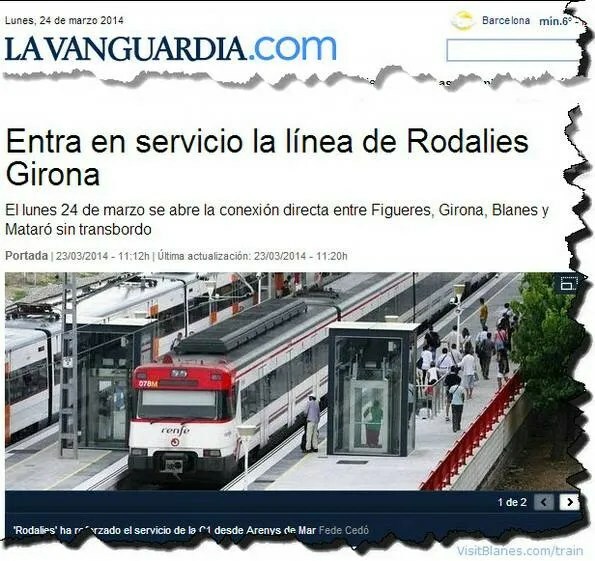 While primarily intended to improve commuter rail services for residents of Catalonia, this service — which started March, 2014 — is also of interest to tourists staying in Blanes. Both Girona and Figueres are popular destinations for day excursions, and these cities are now easier to reach by train. The direct line between Mataro (about 38 km south-east of Blanes) and Figueres (about 80 km north of Blanes) started on March 24, 2014, and runs every two hours. It takes you from Blanes to Girona (about 41 km north of Blanes) in about 45 minutes, while a trip to Figueres takes 1 hour and 15 minutes. Rodalies de Catalunya has also increased the frequency of trains running between many of the smaller stations — serving tiny villages and small towns. Television Blanes news item, in Catalan, covering the start of the new service. Filmed at the train station of Blanes. Rodalies de Catalunya is a commercial commuter rail service operated by Renfe Operadora, Spain’s state-owned rail transport service. Until 2010 — when the Government of Spain handed control over commuter rail services in Catalonia over to the Government of Catalonia — the service used to be known as Rodalies/Cercanías Barcelona. ‘Cercanías’ are the suburban passenger rail transport services that operate in Spain’s metropolitan areas and commuter towns. ‘Rodalies’ is the Catalan name for this commuter rail service. Traveling by train from Barcelona Airport to and from Blanes is easy, inexpensive and convenient. Here are the details. Visit Blanes Copyright © 2019.